Haunting melody lines played in unison on the saxophone and the guitar, clashing rhythms and tempos, and familiar sounding songs that get turned inside out. That's Panzerballett. The brand-new DVD, "Live At Theatron Munich 2013" arrived today. This is top. Great arrangements, technically incredible, and very funny. A perfect combination. Too bad that "Ein Bisschen Frieden" had to be left out on a last minute notice because the band did not get permission from the author. King Ayisoba is responsible for bringing traditional elements into the popular music of Ghana. He even had a huge hit in Ghana in 2006. His latest album is entitled "Modern Ghanaians", and it's a delicacy for fans of world music. The first two Fuzz Orchestra albums are available as a free download over at the Fuzz Orchestra website. Their first eponymous album is from 2007. Their second disc, "Communicato n°2" is from 2009. 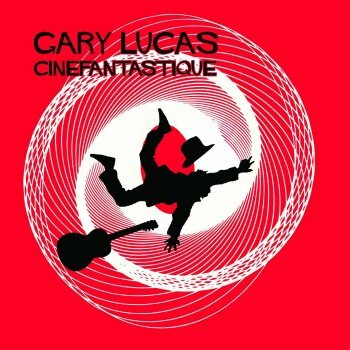 On his latest album, Gary Lucas takes on a number of classic cinema tunes in his inimitable and typical style. The album is out on Northern Spy Records ! Good news from the Zappa Family Trust. Late 2012, Italian rock band Fuzz Orchestra released their third album. Inspired by the heavy '70s rock music and influenced by Ennio Morricone, "Morir Por La Patria" should get this Italian trio a bit of extra attention. I like it. Listen to the sample below to get an impression. The band has been touring Italy and Europe on an almost continuous basis for the last couple of years. Here's there recent schedule. The Roaratorio website mentions Sun Ra's "Other Strange Worlds" album on their News page, which should mean that they are about to release the LP. "early 2014 should see the release of a previously unissued Sun Ra LP from 1966, entitled Other Strange Worlds. It draws from the same sessions as Strange Strings -- perhaps the most singular recording in Ra's entire canon -- but while that album featured a full size Arkestra, this one finds Ra exploring similar territory with a small ensemble. " Englert and Higgs received the Nobel prize for physics earlier this month for their research on the boson particle. Poet, visionary, philosopher and recording artist Copernicus will be glad to hear that the very essence of matter is getting all this attention. Copernicus claims that nothing exists. On a subatomic level, nothing can stay the same from one moment to the next, therefore nothing can exist. We are all living an illusion. 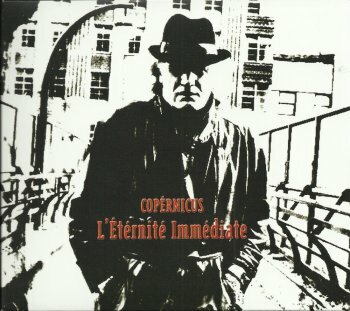 Originally released in the English language in 2001, "Immediate Eternity" is getting a French re-issue on Nevermore / Moonjune Records. Copernicus put french vocals (spoken word) on the already recorded (improvised) music. 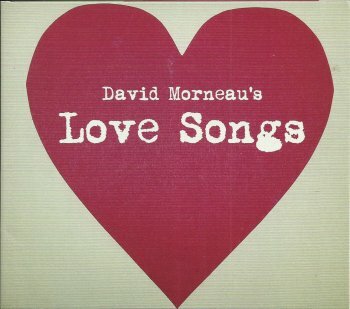 For his latest project, "Love Songs", the lyrics for each track pair one of Shakespeare's sonnets with a contemporary poem. The music ranges from jazzy pop to classical. I thought this was a great concept. I loved the idea. The album itself is as impressive as I hoped it would be. Go to David Morneau's website for more info. The album will get released on Composers Concordance Records on November 19, 2013. Chrome Hoof is said to be "a one-of-a-kind, hugely entertaining,nitro-pop, electro-metal, synth-pop, sci-fi, space-disco, psyche Dalek spectacle". I may only understand half of it, but that's exactly the kind of introduction that makes me curious. After a first listen, I have to admit that the album indeed is very entertaining. It's also very energetic. This British ensemble mixes heavy funk and electro beats with every imaginable genre. 'When The Lightning Strikes' should give you a pretty accurate idea of what Chrome Hoof is about. The Chrome Hoof live shows are also said to be quite impressive. Here's a clip. The upcoming Randy Brecker album will be entitled "Brecker Brothers Band Reunion". It will be a CD/DVD package and it will feature David Sanborn, Mike Stern, Will Lee, Adam Rogers, Dean Brown, and many others. And next year, Randy Brecker will be touring with Terry Bozzio !! About three years ago, I got introduced to the music of Tohpati, the Indonesian jazz guitarist. In my research, I found that he was also the guitar player of simakDialog, the Indonesian modern jazz / fusion band that had already put out five albums, the latter two released on the MoonJune Records label. 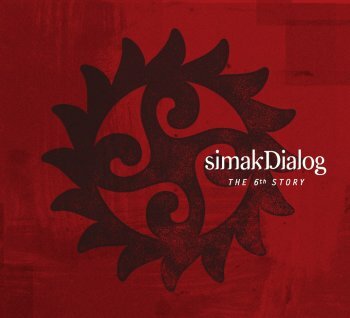 And now there's "The 6th Story", the brand-new and sixth simakDialog album. Led by Riza Arshad (compositions & keyboard), Adhithya Pratama (bass) and Tohpati, simakDialog offers a delicate blend of rock, jazz and world music. Also more than noteworthy on "The 6th Story" is the contribution by Endang Ramdan, Erlan Suwardana and Cucu Kurnia, the three percussionists. Here's a live version of 'For Once And Never', a composition that can also be found on "The 6th Story". Snakefinger's 1984 album received a complete make-over. 9 (nine!!) bonus tracks, extensive liner notes by Eugene Chadbourne and by various former bandmembers, and a superb-looking package. Snakefinger takes a lookt at the history of the blues. Hard to believe that this is the same person who worked and recorded with The Residents and who wrote and performed 'Save Me From Dali', but this is some great stuff. Featuring Steve Mackay and Eric Drew Feldman as part of the band !! Finnish multi-instrumentalist Markus Pajakkala is Utopianisti. 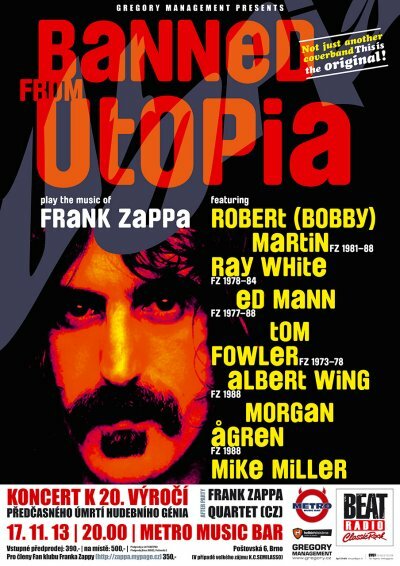 On his first, self-titled album, Utopianisti released 'Waltz For FZ'. Indonesian prog rock band I Know You Well Miss Clara has just released their debut album. The first thing that you notice when you take the actual album in your hands is the stunning artwork by Angki Purbandono. The piece on the cover is called "Back Off Guys!" and it's from 2012. Do yourself a favor and google "Angki Purbandono". You're in for a treat. The actual album is entitled "Chapter One" and it's as gorgeous as the package suggests. The band is led by guitarist and composer Reza Ryan and by keyboard player Adi Wijiya, and the music is a fine mixture of jazz and progressive rock. "I think Clara is a hot name!" laughs Rez. "But seriously, it's like when you have a girlfriend or a partner you get to know them fairly well. I think if people want to hear my compoistions they need to listen fairly well too. So, in a way, Miss Clara is ther personification of my music." The album got released on the MoonJune Records label. Here are some samples including the extraoradinary 'Pop Sick Love Carousel'. Tim Buckley's 1970 "Lorca" album is getting repressed / rereleased by the 4 Men With Beards record label. John Cale's "Paris 1919" is getting a vinyl reissue on the 4 Men With Beards label. It was his fourth solo album and got released in 1973. The album got recorded with help from Lowell George and Richie Hayward (who were in Little Feat at the time) and the UCLA Symphony Orchestra. In 1977, the LAFMS (the Los Angeles Free Music Society) released a vinyl album in a limited edition of 500 copies. 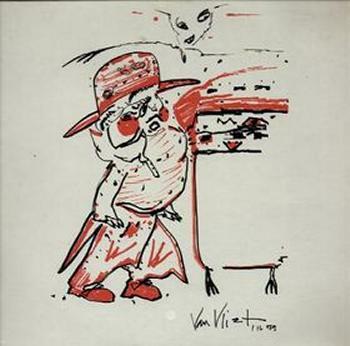 The album carried a Don Van Vliet drawing on the cover and presented some of the weirdest music and sounds around. It was a sampler entitled "Blorp Esette". 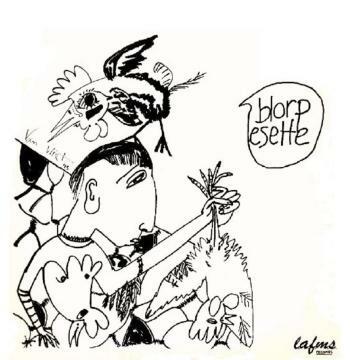 About three years later, the LAFMS released the second volume of Blorp Esette. A 2LP-set, again with a cover drawing by Don Van Vliet. Mastermind behind these Blorp Esette samplers was one of the LAFMS founding members: Ace Farren Ford. 15 years ago, Ace Farren Ford teamed up with Michael Sheppard (of the Transparency record label), and the both of them released a 4CD "Blorp Esette" set that not only included the two early vinyl albums, but also a lot of unheard material. 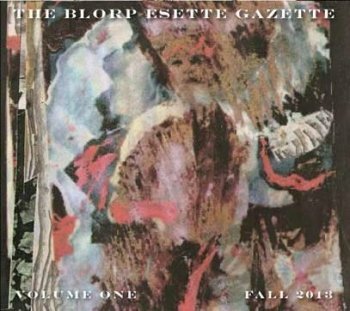 And now there's "The Blorp Esette Gazette", the audio magazine. It's brand-new and it's too weird for words. It's obvious that the Moonjune Records has a soft spot for guitar players. Fortunately, label manager Leonardo Pavlovic has an excellent taste and a keen eye to spot talent from a far distance. This can be taken litterally, as New York City based Moonjune Records signed Indonesion guitarist Dewa Budjana to the label. Earlier this year, Moonjune released Dewa Budjana's very impressive "Dawai In Paradise" album. And now there's "Joged Kahyangan". 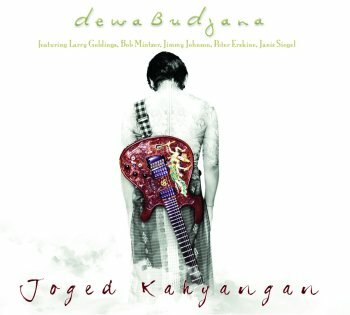 Again, Dewa Budjana shows why he is considered a top guitar player, combining jazz and rock with his Indonesian background. "Joged Kahyangan", which translates as "Beautiful Heaven", features Larry Goldings on Hammond organ, Bob Mintzer on sax, Jimmy Johnson on bass and Peter Erskine on drums. Beautiful compositions, great guitar playing. Over at Zappateers, a nice question has been asked. Somewhere in the early ninetees, Stef Kamil Carlens and Aarich Jespers founded A Beatband. Later the band's name changed to Moondog Jr. and, eventually, the band turned into Zita Swoon. In the meantime, Stef Kamil Carlens had started dEUS with Tom Barman, but he left the group in 1996. 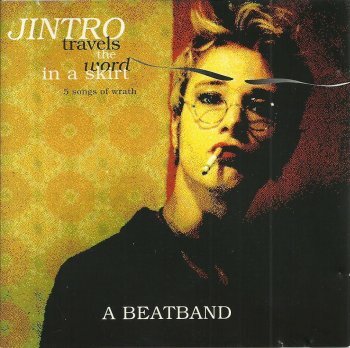 "Jintro Travels The World In A Skirt" is the one and only release by A Beatband. It's from 1993. Every once in a while, you encounter or you get introduced to an artist or a band that makes an everlasting impression. 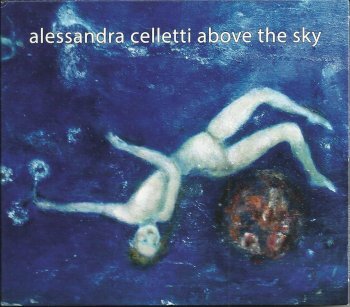 Alessandra Celletti is such an artist. Alessandra has a new album out on the Transparency record label. "Above The Sky" got recorded at Alessandra's home in January 2013. It's a beautiful disc, emphasizing the intimacy and the feminine touch that I appreciate so much in her work. Here's Michel Hatzigeorgiou (of Aka Moon fame) with a solo bass piece (written by Fabrizio Cassol), recorded in 2007 ! Originally from Paris, France, The Kandinsky Effect currently resides in New York City. 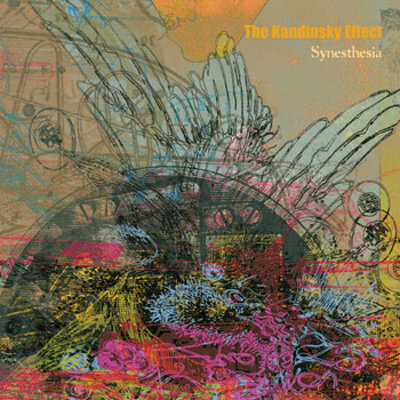 On "Synesthesia" the ensemble shows just how beautiful modern jazz can be. The use of rock elements and electronics is an added value. I love the melodies. I love the drive. Rob Mazurek's (cornet, electronics) encounter with Mauricio Takara (drums, percussion) in Brazil led the foundation for Sao Paulo Underground. With the addition of Guilherme Granado (keyboard, electronics) the power trio was complete. 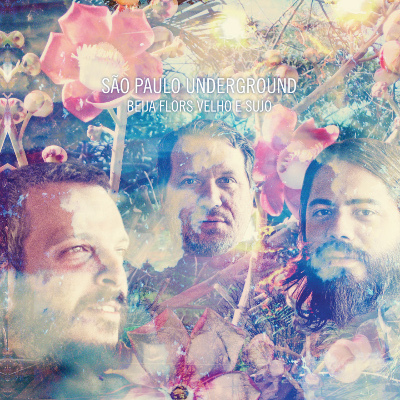 "Beija Flors Velho E Sujo" is the SPU's fourth album. It mixes rock and free jazz with south american rhythms. A fine blend of beautiful melodies, uplifting beats and intergalactic trips. 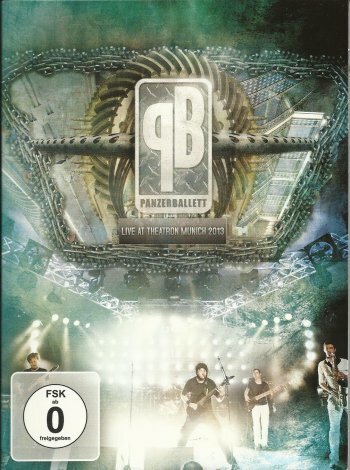 The Panzerballett DVD "Live At Backstage Munich 2006" has been out of print for a while. (If anybody cares, tt's still on my want-list). "In honor of the 40th Anniversary, Santa Dog 2x7" vinyl is again set for release as soon as it gets done. A few months from now I am guessing. A big batch will be offered for free too, in the spirit of the original release. Maybe it will even get sent to Nixon and Zappa again. Don't know for sure. I'll give details when delivery is near. Released by Superior Viaduct. 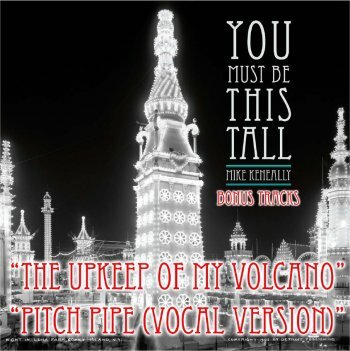 http://www.superiorviaduct.com/"
Mike Keneally has released two bonus track to his latest "You Must Be This Tall" album. These tracks were made available for free for those who helped to promote the album through the various (social) media.
" 'The Upkeep Of My Volcano' came from trying to figure out what to do with the basic material which ultimately became "Kidzapunk" on the finished album. It features a completely different melody/lyric over a much-shortened version of the basic track. For more information about volcano maintenance please refer to the book The Little Prince by Antoine de Saint Exupéry. 'Pitch Pipe (Vocal Version)' was almost the way it ended up going on the album, before I decided that the instrumental version fit better with everything else. This vocal "space opera" version seems to me to be a distant cousin to "Sooth" from Boil That Dust Speck. It is immensely bizarre." I'm pretty sure that these tracks will be made available to a wider audience soon. They deserve to be heard by every MK fan. 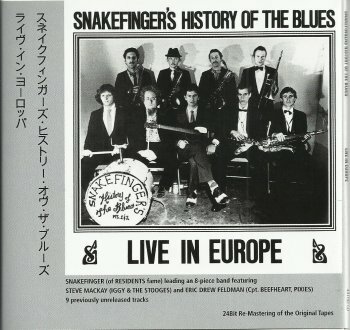 Out on the Promising Music label: Snakefinger's History Of The Blues: "Live In Europe". With 9 bonus tracks ! "Pianist Sarah Cahill commissioned a number of solo piano pieces for a live concert, including a ditty by The Residents, drum no fife. 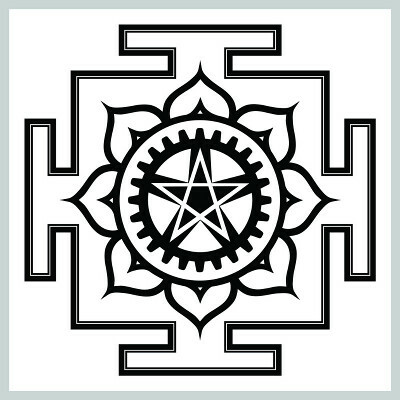 (9:07). This CD collects a number of the compositions as studio recordings. Other composers include Terry Riley, Meredith Monk and Yoko Ono." Tomorrow, Sunday, October 13, 2013, Corrie van Binsbergen en Anneke van Giersbergen will share he stage at the Roepaen Podium in Ottersum, NL. The countdown is on! We are only days away from departure for the extended "Roxy & Elsewhere" tour. The "Elsewhere" portion is taking us on a return trip through Canada and the UK. Plus some far-reaching European cities like Helsinki and a new stop in Estonia! So much of the material on the "Roxy" has a greasy layer of funk and groove making it one of the most enjoyable records to listen and certainly some of the most fun music to play live on stage. Come and do your part in "The Be-Bop Tango!" Alongside the "Roxy" I have compiled a wildly varied assortment of other tunes spanning FZ's career for us to sprinkle in to the set. We will be premiering tunes we have never played before including the "Orchestral Favorites" arrangement of "The Duke Of Prunes." It's replete with gobs of feedback-laden guitar. Stay tuned for a big announcement on how to enter yourself in an upcoming contest that could win you the opportunity to see a Zappa Plays Zappa "Roxy" show and possibly win you a Gibson Frank Zappa Roxy SG! "Ask Ozzy, Zappa, or Me. We'll show you what it's like to be free." - from "Censorshit" by The Ramones. 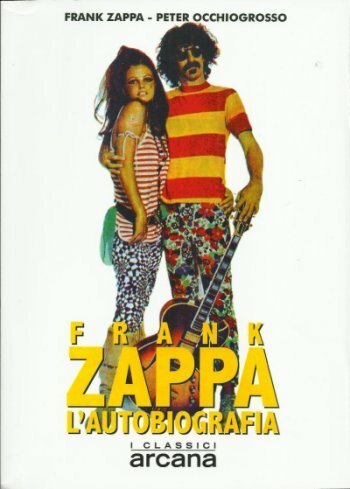 I just added a picture of the third edition of the italian version of The Real Frank Zappa Book to the United Mutations Archives. re-release. 1st edition in 1990, 2nd edition in 1995. Walt Fowler is featured on the latest Steve Gadd album, Gadditude. OCTAFISH präsentiert neues Programm am Samstag den 9. November 2013 im IMMERHIN WÜRZBURG. Mit dabei der Video-Künstler "zeitschleife visuals". www.soundcloud.com/bierbopbullys "Rehearsal Recording" unseres aktuellsten Titels TEKKPA. OCTAFISH startet um 20 Uhr. Im Anschluss spielt die dänische Formation SVIN. Go and get it !!! Sun Ra Research San Francisco October 31 1991 from peter hinds on Vimeo. on the label "Gentle Art of Music". a good performance! So we decided for a release a major part of that show -- 9 tracks. Pre-ordereing is already possible through www.panzerballett.de ("Merch"). IA will personally join us on the double dates to perform "The IKEA Trauma" with us. On www.panzerballett.de ("Tour") you will find links for buying tickets to some of the shows. Announced earlier this year, "The Futuristic Sounds Of Sun Ra" album got rereleased on vinyl by Poppydisc about two months ago. An exact reproductionof the original album. It's been a busy start to the season. Composers Concordance jumped into it with a great fundraiser/party at MC gallery and then immediately our first concert - at BWAC. We have many concerts planned for the this year - including our big festival 'Timbre Tantrums' and other concerts being planned now, including a big one at the 92nd St. Y - 'Eclectic Bands/Eclectic Dance' in March. NEXT concert is: C&C PIANO FACTORY on Oct. 13th in partnership with Composers Collaborative inc. Listen at 3pm & 8PM here: http://www.wqxr.org/#!/programs/balliett/ - It was a really fun interview with Doug and Brad and I got to play a bunch of my music for them and music of my colleagues. CompCord Ensemble performs at the Cutting Room. Gene will have a new septet for this show featuring the poetry of Jacob Miller. I recently came across this factory pressed Steve Vai bootleg. 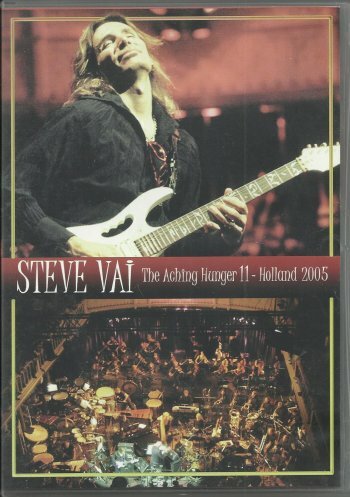 It's a recording of the two Dutch TV-shows from December 2005, showing "Aching Hunger Phase II" from the July 2005 concerts. Mu's first and eponymous album will be reissued on the Spanish Guerssen Records label. Mu is Merrell Fankhauser and Jeff Cotton (of Captain Beefheart's Magic Band). This first album got released in 1971. Here's a snippet from 1974. 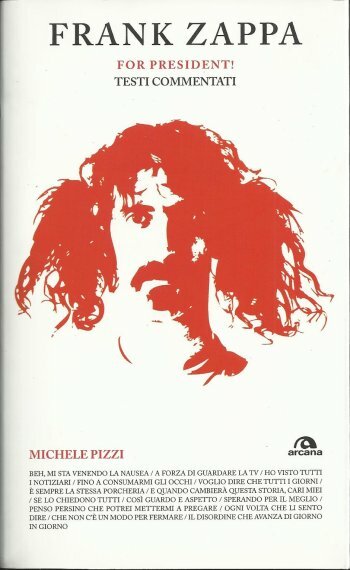 A couple of years ago, Italian jouranlist Michele Pizzi wrote a 500-page book on Frank Zappa, entitled "Frank Zappa - For President! - Testi Commentati'. The book is in Italian. It got published by Arcana Edizioni. I added the cover to the Frank Zappa "Books" section earlier today. Go here: http://lee-santa.artistwebsites.com/art/all/sun+ra+at+the+bottom+line+1976/all & you'll see some new stuff from my 1976 Bottom Line NYC photo shoot that I had forgotten about. I uploaded 27 images of which 9 or 10 had been uploaded before into the Sun Ra Gallery, so at least 17 images have not been seen before. Some of 'em are a little outta focus which is probably why I forgot about 'em. More Zappa than you or I can handle in one night. But we're doing it anyway! As always, anybody who lives too far from the Falcon who would like to know what's in store, let me know and I'll gladly send you my set list. As of today, a digital version of Morgan Ågren's Conundrum (A Percussive Misadventure) has been released through Vimeo On Demand. SO: we have also started taking orders for the DVD on MutantMall.com. However, the DVDs are still being pressed and should arrive in 2 weeks. Still, you can place your order any time. Morgan Agren's Conundrum (A Percussive Misadventure) - OFFICIAL TRAILER from Carl King on Vimeo.